As we'd been discussing using foil packets for camping and cook-out meals, I thought I'd share what we did over Labor Day weekend. I knew this had to be cheap (meaning I didn't want to run out to the store to buy any "special" ingredients). And I knew it had to be easy, as I had a meeting later in the evening, and I didn't want to be exhausted when I walked into the meeting. To satisfy the cheap aspect, I used all garden vegetables -- potatoes, shallots, green peppers, tomatoes, green beans and summer squash, plus used (but clean) aluminum foil sheets. And I used 1 pound of ground beef, bought on sale at Cash & Carry a couple of weeks ago, for $1.88/lb. To be easy, I began the "preparations" early in the day. When you're using garden vegetables, "preparation" includes digging, picking and washing those vegetables. If you've only ever used supermarket produce, you may not be aware of just how dirty vegetables can be, fresh from the garden. Garden potatoes can be filthy! Anyways, I dug potatoes and picked the rest of the vegetables just after noon. Cleaning them was done in spurts between loads of laundry. I also seasoned the ground beef (with onion powder, garlic granules, salt and ground chipotle pepper), at this time, formed into patties and kept in the fridge for the rest of the afternoon. Quite delicious! And very little clean-up for me. we loaded the chopped potatoes onto the bottom, for best cooking close to the heat, then the rest of the veggies, and finally the meat patties, to drip their savory juices onto the vegetables. Those foil packaged dinners look and sound great. I did a bonfire this weekend also (on Saturday) but not for fun. We can't burn leaves where we live but you can do a little dead branches in a burn pit. I created a small burn pit but I had a huge pile of branches that blew down during the spring and summer. I worked on breaking and cutting them all into manageable pieces and proceeded to burn them in the burnpit. I didn't even think to do dinner on the fire while I was at it though it would have worked really well. I did cut (yes, with a chainsaw!) 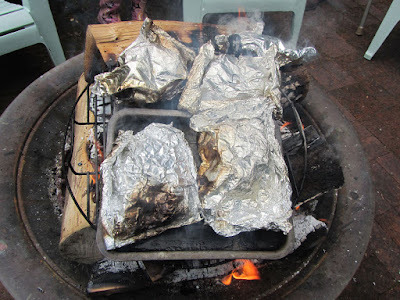 a bunch of bigger logs and saved those behind the barn so I could still do foil dinners in the future. Wow, Alice! That sounds like a lot of hard work! Good job! Isn't that interesting?! Here, we can burn a fire for cooking, but we can't burn yard waste. But I can remember, long ago, people burning barrels of branches in the late summer, early fall. One thing I like about foil dinners is the way everyone can customize them the way they want. And that was very much appreciated by my daughter who doesn't like some veggies. She was able to just leave them out of her packet. It worked very well, and the meals were quite tasty, having that slightly charred, outdoor fire taste. Foil packets look fun. It is nice to know if utilities are out this could be another option for cooking. The weather is cooler today. I am so greatful. Maybe we will have soup for dinner. It's a good option, I think. We were able to get an outdoor fire hot enough to thoroughly cook everything in the packets, meat included. I'm glad the temps have cooled off, there, for you. I can imagine it doesn't really feel fall-like as early as it does for my area. Have a good day, Patti! I've never made these. My husband's step-Grandma served foil packet meals on one of our visits. She had used cube steak, potatoes, onions, carrots, salt, pepper, and garlic powder. They were good. I think I'll try these using some other variations. How long did it take to cook yours? Cooking time is going to vary with the heat of the fire, and how close the packets are to the flames. All that said, they were done much faster than I imagined they would be. After a few minutes (maybe 4 or 5 minutes) of hearing hissing/sizzling, I removed my packet from the fire, and took a peek at the meat (it was on top). The juices were still a little pink, so I put it back on the fire, for another 4 or 5 minutes. I checked the meat again, and it was done. I just looked for clear juices from the meat. Of course, timing wise, if you're using veggies that take longer to cook (like potatoes), you won't be able to have rare meat. By the time the meat was cooked, the potatoes were just firm-cooked. Part of that is the type of potato, I was using, they take longer to cook. 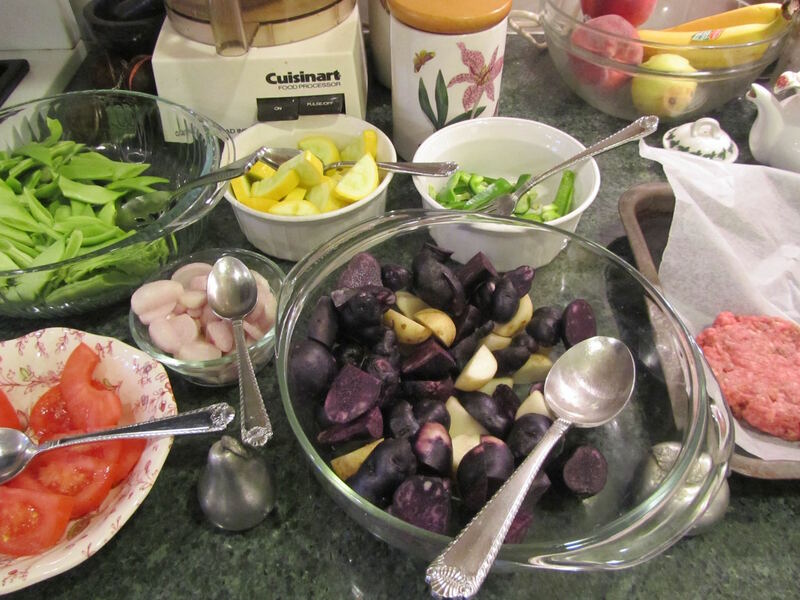 (Those were the purple potatoes.) And part was the size of chunks of potato. I should have cut the potatoes into smaller chunks, maybe 1-inch cubes. These packets would be great to use up odds and ends of a garden harvest, when it doesn't seem like you have enough of any one vegetable for a family supper. I remember having these on Girl Scout camp-outs, with ground beef, cut corn and carrot chunks inside. There are a lot of combinations of veggies and meat that would work well, I think. Good tips, Lili. And you are right ... it's more work to clean and cut up fresh garden veggies--they sure do get dirty. As much as I love having the fresh veggies in summer, I do look forward to cooking without having to clean so much, all winter. But I shouldn't wish those fresh vegetables away just yet! You're totally reminding me of Girl Scout camp! We used to cut the potato in half, and then put all the meat and veggies "inside" it (sorta wedged between the halves) and then just wrap it all up in foil and stick it in the hot coals. Yum, yum, yum!! oh those sound good! I am definitely going to try those stuffed potatoes. Thanks for sharing. It's something that I never imagined, just how dirty garden produce is. I does make me appreciate how relatively clean carrots and potatoes are, from the store. I hope you're getting lots of days of work this week, Belinda!